The Spy Who Loved Me from yesterday was a repost from three years ago. When I originally posted the treatment for a movie based on the un-filmed Bond novel (the film of the same name is not based on Ian Fleming’s novel) I promised a similar idea based on Moonraker. Better late than never here it is after three years. So you think you know Moonraker? As the great Ross McG from Ross v Ross once said, ‘Oh, Star Wars is huge! 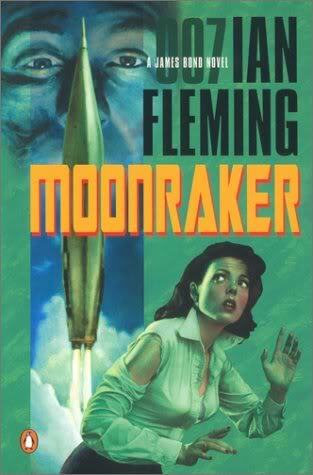 Lets put Bond in space with Moonraker!’ That’s not far off the mark. But back in 1955, just ten years after World War II and during the Cold War Ian Flemings’s third Bond novel was very different. The only way this would work as a movie would be to reboot the series and set the movie in the 1950’s, something I have wanted to see for a long time. M asks Bond to join him at his club, Blades to sit in a game of bridge. Millionaire businessman Sir Hugo Drax has been winning a lot of money, M suspects him of cheating and wants to know why. Bond confirms M’s suspicions and turns the tables by cheating himself winning a large sum of money. The mysterious Drax was a British soldier who made his fortune in the aerospace industry after being injured and suffering amnesia during World War II. A national hero because of his backing for the Moonraker project, Britain’s first nuclear missile intended as a nuclear deterrent during the cold war. (Britain’s first nuclear missile the Blue Streak was actually announced around the time the novel was published). Bond is sent to Drax’s factory near Dover to replace security officer working on the project who was shot dead. While there he meets Gala Brand, a beautiful (isn’t everyone in the Bond world) Special Branch agent working undercover as Drax’s personal assistant. It appears Bonds predecessor was killed to stop him revealing a sighting of a submarine off the coast. Bond also makes the surprising discovery (remember this is only ten years after the war) that all the scientists working on the Moonraker project are German. Meanwhile, Gala discovers the truth about the Moonraker, its first test flight will be aimed at the heart of London fitted with a Soviet nuclear warhead. She is captured and imprisoned in the building containing a beacon the missile will be aimed at. Bond’s attempt to rescue Gala fails resulting in his capture and the destruction of his beloved Bentley. It is then that Drax, in true megalomaniac villain style reveals is back-story and his plans: he was not a British soldier and did not have amnesia. He was the leader of the commando unit (dressed in British uniform) that caused the explosion he was injured in. The amnesia, a cover story while he recovered in a British hospital. After the war he took up a new identity as cover but retained his Nazi beliefs and conceived the Moonraker to destroy London in revenge. In the process he also intends to make a killing on the stock market. To destroy all evidence Brand and Bond are moved to the area under the Moonraker’s engines just before it is fired. They promptly escape and with the help of Soviet Intelligence change the coordinates to redirect the Moonraker safely into the sea. Drax is killed attempting to escape in a Russian submarine. Bond meets up with Gala but is snubbed in favour of he fiancé. So how have I come up with such a great story? Put simply I haven’t, this is not a treatment for a movie this is an overview of the plot lifted straight from the novel. So who would make it? Director Quentin Tarantino has often mentioned his interest in directing a Bond film. If anyone can make the 50’s setting work it is him. And to reboot the series again we need a new bond. 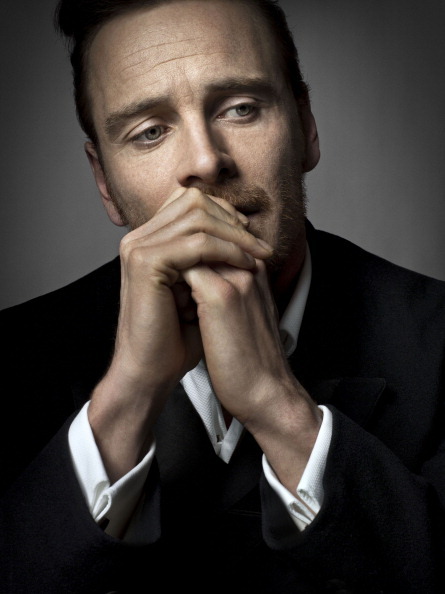 Already a contender for the next James Bond, Michael Fassbender cemented his period credentials in X-Men: First Class and Inglourious Basterds. Gala Brand needs to be played by a talented and attractive British actress with Hollywood credibility, it has to be Emily Blunt. 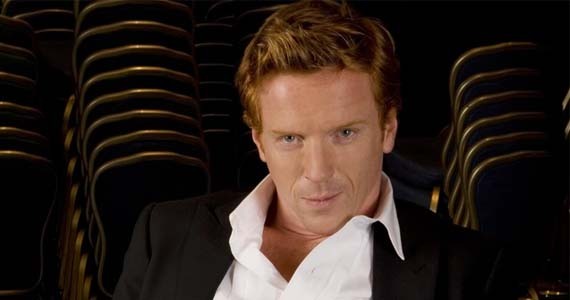 I’m not sure on who should play Sir Hugo Drax, maybe I am getting hung up on the red hair described in the Novel, but I am thinking Damian Lewis. Financially rebooting the series to a 50’s or 60’s setting would be a huge risk that I can not see the studio taking. But artistically the franchise has already done all it can and said all it has to say, a new direction will give it new direction and new life. 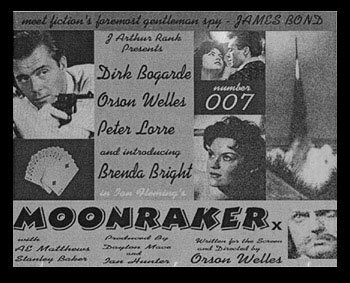 And if you are wondering the poster at the top is from a 2004 Internet hoax that claiming to have found 40 minutes of footage from an unfinished 1956 version of Moonraker directed by Orson Welles staring Dirk Bogarde as Bond, Welles as Drax.